In the Friday Issue of the Monthly Princess Magazine by Akita Shoten, it has been revealed that Shinobi Life mangaka Shoko Conami will present a new series in the same publication. This new manga will be dubbed as Shikabane Cherry, or the Corpse Cherry, which obviously calls for another zombie-themed adventure where horror and romance takes place. while this may sound cringing to some, let’s take a deeper look at what this new manga has in store. Conami is best known for her previous creation, Shinobi Life, which tells about the story of Beni, a teenage girl who aims to embarrass her proud father bu causing trouble. However, one day during her mischief, she was rescued by Kagetora, a mysterious ninja who fell from the heavens. It was soon learned that he reached this dimension after time travelling, where long ago, he swore his loyalty to protect a princess named Beni. Kagetora did not realize that this girl is not the same Beni he pledged to guard, nor it was a different era where he was supposed to be. 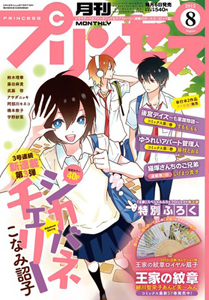 Shinobi Life just ended in the April issue of the Akira Shoten’s Monthly Princess magazine. While there was to be a spin-off story in the May issue, she quickly replaced her hit series with another exciting novel, focusing on an adventure of a corpse girl. Shikabane Cherry tells of the story of a young girl who, wanting to keep her skin aglow for an important event in her life, decided to take a large quantity of a secret medicine. It was said that this will help her skin cells afresh, making her look more beautiful than ever before. Unfortunately, what she did not realize in this overdose, is that it already stopped her heart and made her ultimately into a zombie. More details about this manga to be posted soon, so stick around!